This software doesn't run on a modern MacOS X machine because the binary code is for PowerPC CPU but not Intel. Because the author has given up to continue maintaining the source code to be runnable on the new machines, here you can use the original source codes for your creative activities in any manner under the following condition. In case you want to distribute, publish, or sell something containing a copy of any part of the code or the other resource in any form including printed image, you are liable to attatch the information clearly understandable which part is the copy from the code. The author would be happy if this code could inspire anybody to somthing creative. You can download the code from SBEAT32original.tgz (1.2MB) or SBEAT32original.zip (1.7MB). July 23rd, 2013 Tatsuo Unemi. sbeat 3.2 β1 for PowerMac Carbon was released on November 27, 2003. 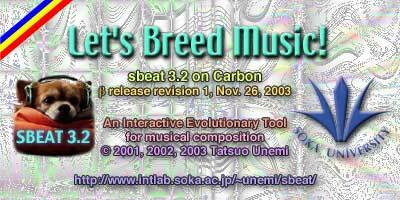 SBEAT developed by Tatsuo Unemi is a composition support tool to create short musical phrases and rhythms based on artificial selection, similarly as SBART. This is an application of Simulated Breeding, a type of Interactive Evolutionary Computing Technique. MIDI Sample tune. Created in August 20, 2002. Click here for more sample tunes. New tune was added in March, 25. News: Audio and Digital CDs of the 2nd Iteration that include my products were released. Please check here to get them. Download binary (399,328 bytes), and try it! ... FREE as a beta version. You can also get the older version 1.0b1 from here, 2.0b1 from here, 2.1b1 from here, 2.1b2 from here, 2.1b3 from here, and 3.1b1 from here. System requirment: Power Macintosh with one of MacOS 9.1, 9.2, MacOS X or thier upper version with QuickTime 4 or upper is requiered for sbeat 3.1b1. In the cases of MacOS 9.1 and 9.2, Appearance 1.01 and CarbonLib 1.3 or upper are also requiered. QuickTime 5 or 6 is strongly recommended for better performance. 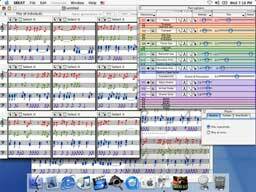 T. Unemi: SBEAT3: A Tool for Multi-part Music Composition by Simulated Breeding, Proceedings of the eighth International Conference on Artificial Life (A-Life VIII), MIT Press, 410-413, Sydney, NSW, Australia, Dec. 2002. T. Unemi: A design of genetic encoding for breeding short musical pieces, E. Bilotta, D. Gross, et al eds. ALife VIII Workshops, ALMMA II, 25-29, University of New South Wales, Sydney, NSW, Australia, Dec. 2002. Links to IEC Artistic Applications.